These custom made nylon UV protected backstroke flags are made to color and length specifications. They can be sewn onto a line or purchased individually to be put on a cable.They can be made in any color you want, you choose. Want your team logo or the lanes numbered? We can do that for you too! Call us to give us your specifications and we will give you all the info to get your custom backstroke flags ordered. They will last you a long time because the material is so duarable. Polar Bottle has a milar coating to insulate hot or cold for proplonged periods of time. The top can be disassembled for proper cleaning. Pick from the choice of sharp vivid color choices. 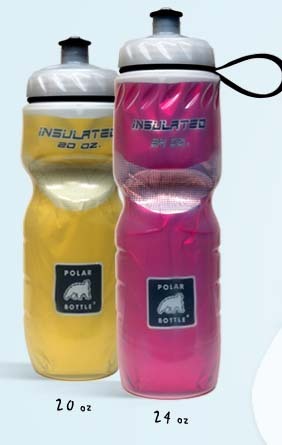 Polar Bottles have a milar insulation to retain heat or cold for a prolonged time. The bottle top can be disassembled for a thorough cleaning between uses. Pick from a number of colors. This LAP COUNTER is 14" x 14" sturdy, durable counters which can be placed in the water to be used to help a swimmer keep track of what lap they are getting ready to complete when swimming distance events. This is regulation size and has a cut out to place hand for easy grip. The towel for all sports, and the choice of Champions. This towel has been used by swimmers and divers for over 20 years. The Sammy is made of a high tech PVA material, which is highly absorbent. The Sammy is an ideal way to dry off after practice dives or laps, and dries your body or hair after a shower. The Sammy replaces bulky towels. It dries your body and hair more quickly than traditional towels. The Sammy is convenient for traveling and comes with its own storage tube.